It’s almost as if the food truck gods heard my food truck prayers and answered my wish. 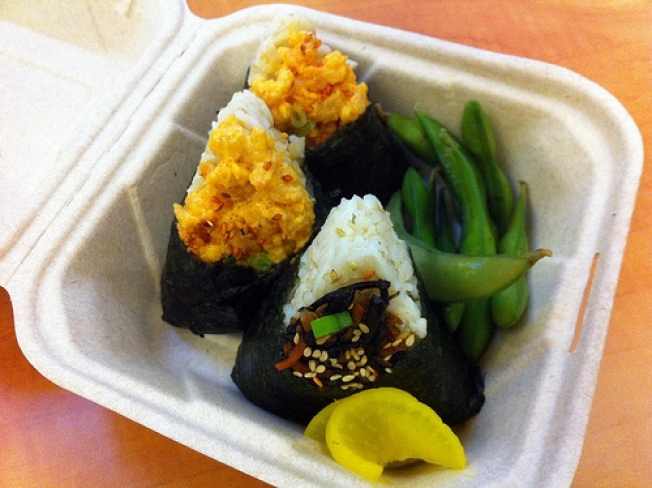 For months, I’d been telling people that what San Francisco needs is an onigiri stand. And lo and behold, Onigilly opened up shop in the Embarcadero. Onigiri are Japanese rice balls wrapped in nori seaweed and stuffed with an array of delicious fillings like pickled plum or salted salmon. Portable and easily customizable, they make the perfect snack or lunch on the go. When Onigilly began serving lunch a few months ago, I stopped by with a colleague to try out their healthy riff on one of my favorite foods. Onigilly uses brown rice instead of the traditional white, and their fillings are a modern take as well. I had two masago roe and one hijiki seaweed onigiri, garnished with edamame and pickled radish. The masago was rich, as the salty roe had been folded into a spicy aioli, and the hijiki served as a delicious palate cleanser. These are not the onigiri that I became used to snacking on in Japan, but a California-style take that’s just as tasty. The Onigilly food cart can get busy, so plan accordingly. Each onigiri is made with care and by hand, and service can be slow at times. The owner is charming and happy to talk to patrons about his creations, so the wait goes by quickly. Make sure to check their Twitter account ahead of time to make sure they’ll be open.